New Mobil Delvac 1 LE 5W-30 is a low-viscosity, synthetic diesel engine oil that is formulated to deliver engine protection and sustainability-related benefits, including enhanced fuel economy potential and long drain intervals. It’s recommended for diesel-powered commercial vehicles and a range of off-highway equipment. It also meets or exceeds an extremely broad range of industry and manufacturer specifications. In extensive on-track testing, Mobil Delvac 1 LE 5W-30 demonstrated its ability to help enhance fuel economy vs. conventional 15W-40 engine oils. 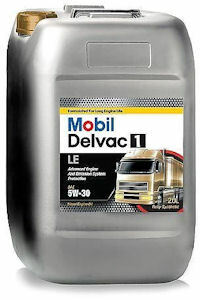 And when used in combination with Mobil Delvac Synthetic Gear Oil 75W-90 in the rear axle, and Mobil Delvac Synthetic Transmission Fluid 50, , Mobil Delvac 1 LE 5W-30 demonstrated statistically significant fuel economy results compared to mineral lubricants (dependent on vehicle/equipment type, driving conditions and current fluid viscosity).